Pantry Moths Trap Reviews - How well do they work? 4.85 based on 143 votes. 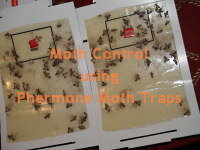 Moth Traps sold by Cleaner Today are universal pheromone traps which target the genus Plodia interpunctella (which includes Flour Moths, Pantry Moth, Bird Seed Moth ) used for any food, feed or grain moths. You can also view pantry moths in the moth trap photo gallery : Pantry Moths Pictures. What do our customers say about Moth Traps? I just got my catchmaster traps for moths. I put one in the garage where the infestation had started because of a bird seed gone bad. Within and hour and one half I checked and had at least 30 moths in the trap already! 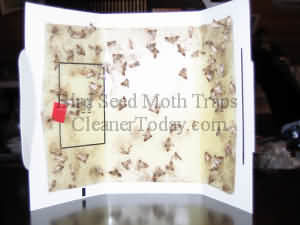 This is one great moth trap product! The Moths Came from Everywhere! I do not normally leave comments about products, but these moth traps are outstanding! For three weeks I have been killing the moths with a flyswatter and I thought I was doing a great job of getting rid of the pest. When I recieved the traps in the mail I handed them to my wife and said "Well dear here you go, and good luck because I think I already got rid the moths." In just a few minutes my wife starts laughing and called for me. I walked into the kitchen and "WOW" the moths came from everywhere. They were all over the place. Within 30 minutes we had moths in all four traps. I would just like to thank Cleaner Today for the moth traps and the fast shipping. I will share my experience with all my friends and let them know about the Cleaner Today company. Bad Cat Food, Fast Meal Moth Traps! I just wanted to let you know that I received my order for moth traps today. I had noticed the moth population had started to dwindle the past few days (they must have been hiding) but within a minute of assembling one of the traps, there were at least 5 moths right near it. I put that one by my front door and put the other one in the kitchen. We went out for dinner and when we got back there were quite a few moths in the trap by the door and at least 1/3 filled for the one in the kitchen. I just assembled 2 more traps and before I did, not a moth to be seen, but again, within seconds they appeared! I am just so thankful for your product and so amazed at how quickly they are working! I have had indian meal moths ever since I got a "bad" bag of cat food and they have driven us all crazy for months. I am going to tell everyone I know about your company!! I just opened the flour moth traps! I got them out of my mailbox, took them in the house and I could barely get the first trap put together and moths were all over me. Once I found my bugs in flour canister I knew where the moths were eating. I threw out the flour, and am on my way to controlling the moths with these traps. Moth Pheromone Traps sure do work! WOW!!! Got your moth traps and they sure do work! and the moth traps are a Godsend. After about 2 weeks, we have 3 traps out that have about 25 brown moths in each of them. We still haven't found our source, but with those traps we have seen an enormous reduction. These three pantry moth traps show the results from 3 weeks on the job. The left 2 Moth Traps were located in the pantry itself, and the right moth trap was above the door in an adjoining bedroom (in case moths escaped the kitchen. As you can see the moth pheromone did its job a trapped quite a few moths! Great product! I will be ordering more so I can always have a moth trap early warning system. 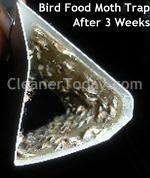 Here is a photo of a Bird Seed Moth trap after about three weeks... yuck! The Moth Trap was placed nearby cabinets that hold bird food. I placed Moth traps throughout the house and problem solved! I put the moth trap on top of the cabinet and had great results! I will definitely order from you folks again as need arises. Moths Caught Near My Bird! Thought you might want to see a photo of bird seed moths I caught in your bird seed moth trap. It was in the room where my bird resides! 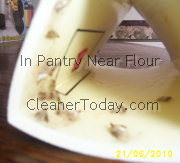 Moth traps eliminate the pantry pest flour moth, indian meal moth and other pantry moths.